Thunderstruck II is the makeover the popular slot game Thunderstruck. The opening clip contains images set in the background of lightning and thunder. The video clip introduces the unique features of the slot game and the four Gods from Norse mythology, which is central to the theme. Valkyrie chooses who will next die in battle. Loki is the mischief maker. Odin is the king of the Gods and Thor is the God of Thunder. Asgard the capital city of the Norse Gods is also represented on the reels, as is the famous Longship. The Thunderstruck II Logo is the wild symbol and Thor’s Hammer is the scatter symbol. The high value card symbols from A to 9 give the appearance of having been crafted from hard rock. During the free spins they change their appearance and resemble being crafted from marble. All the thematic symbols show animation. Valkyrie rides her wild white horse with her spear in her hand. Loki twirls his green fireball and his hair is also aflame. Thor pumps up his mighty hammer ready to strike. Odin’s ravens start hovering about him. In Norse mythology the ravens are the spies of Odin and tell him everything they see and hear. The coin denomination varies from 0.01 to 0.25. Players can wager up to 10 coins per line. The line payouts in the pay table are multiplied by the coins wagered per line in case of a win. The slot has 243 ways to win and hence the concept of enabling a number of paylines is irrelevant. The total bet per spin is 30 times the line bet. The Thunderstruck II Logo is the wild symbol and doubles payouts when it helps to make winning combinations. However it does not act as a wild symbol during the Wildstorm Feature. The Wildstorm feature is randomly triggered and can turn up to five reels wild. Free spins cannot be triggered during this feature. 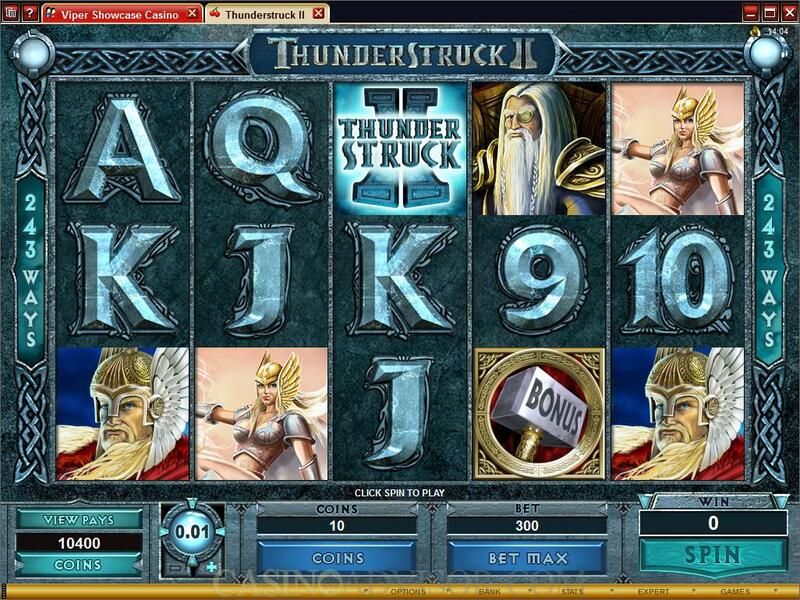 The Thunderstruck II Logo offers the highest fixed jackpot of 1000 coins. Thor’s Hammer is the scatter symbol. Two or more scatter symbols offer scatter payouts that are multiplied by the total bet. Three or more scatter symbols anywhere on the reels offer entry to the Great Hall of Spins. There are four free spins games in this Great Hall. The first four times the feature is triggered players get to play the Valkyrie game. From the 5th to the 9th trigger the players get to play the Loki feature. From the 10th to the 14th trigger the players get to play the Odin feature. From the 15th trigger the players get to play the Thor feature. Even when players exit the game the software remembers the players’ positions and continues from there when they resume. The Valkyrie feature offers 10 free spins with a multiplier of 5x and the feature can be retriggered. 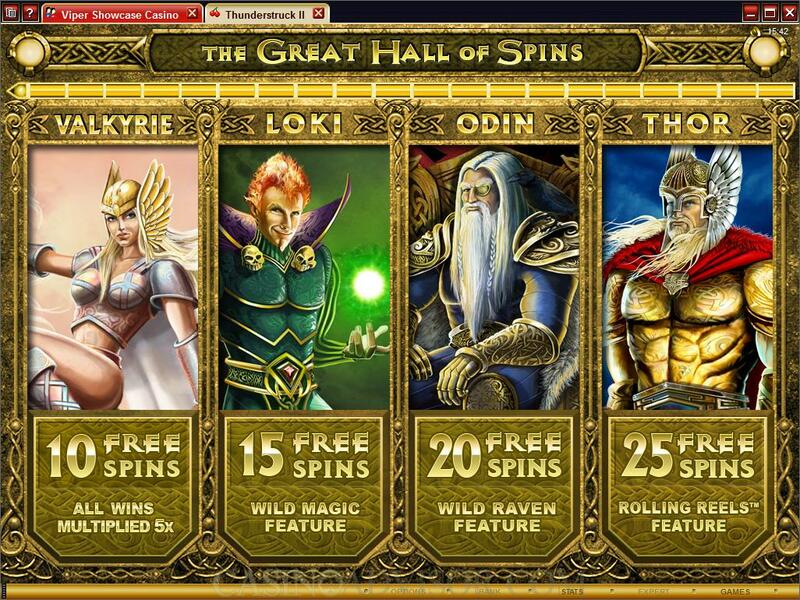 The Loki feature offers 15 free spins with Wild Magic feature. This feature randomly transforms symbols into additional wilds. The Odin feature offers 20 free spins with the Raven feature. This feature randomly transforms symbols into multipliers. 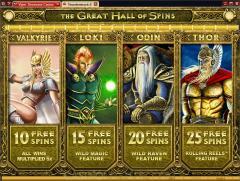 The Thor feature offers 25 free spins with the Rolling Reels feature. Interested in reading more detailed information about Thunderstruck II? If so Click Here for more details.